Purgatory House is a pick-up & play, haunted house role-playing game of unrelenting horror. Infinitely replayable, the House is different every single time. 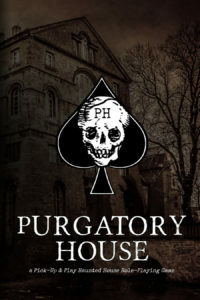 With a simple, Blackjack-based rules system, 8 starting scenarios, and 47 pre-generated characters, Purgatory House is easy to play, easy to run… and easy to die. No preparation is required! The House is created as you play. All you need are two decks of regular playing cards, some pencils and paper, a handful of tokens or coins, and friends who enjoy being terrified. Can you be the few who survive? Now at your Local Gaming Store too!